Have you lived in your current home for a long time? Have you just recently moved into a fixer-upper? If you’re looking for a way to spruce up your home without doing a complete renovation, the solution is simple: start with the kitchen! 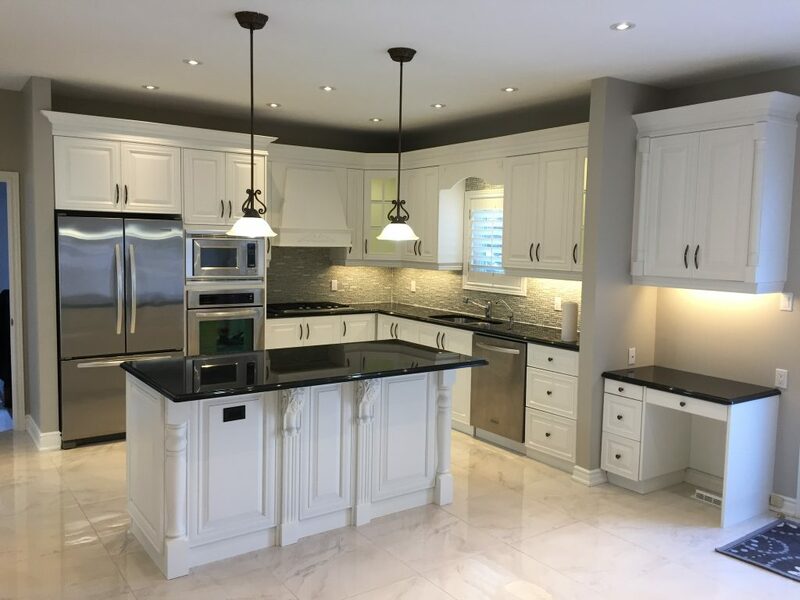 Kitchen cabinet repainting in Toronto can transform the look of your home and offers many benefits such as saving you money, increasing the value of your home, and making the space look bigger, brighter and more welcoming. Here are some of the benefits of working with the kitchen cabinet team at Booth7. Toronto kitchen cabinet painting costs far less than replacing your kitchen cabinets—75% less to be exact. You’ll be surprised by how far a little sanding and a fresh coat of paint can go and how much money you can save for other home projects later. Our professionals offer fair prices and have the skills and techniques to return your cabinets to their original look or transform them to suit your new décor. Cabinets that look worn, old, and faded, or that have peeling paint can make your whole kitchen look unkept. For a change of scenery and to make your kitchen look more put together, our cabinet painters in Toronto can help you. We will clean and sand warped, chipped wood, and add a fresh new coat of paint to make your cabinets look as good as new. For an extra modern touch, we can also update your handles and knobs. Remodelling your entire kitchen can take weeks and can cause a disruption to you and your household. With our kitchen cabinet repainting services, we remove your cabinet doors and drawers off their hinges and take them to our warehouse for refinishing. It only takes about 1-2 weeks. During this time, you can continue to use and socialize in your kitchen with your family. Once we’re finished, we will reinstall the updated pieces (without any lingering paint smells) and it will be as if they transformed in the blink of an eye! Manufacturers have developed new and better paint products, like the eco-friendly paints and lacquers we use. These new paints adhere better to cabinets and are more durable to scratches and bumps. More households are realizing the simplicity and value in updating their kitchen cabinets as a cost-effective alternative to a full-scale kitchen renovation. When your home’s décor doesn’t meet your expectations, you may hesitate to invite guests over. However, when you’re proud of your home, you will be more likely to have people over to enjoy a meal or celebrate an event. Socialization is important for your health, and if your cabinets make you shy away from having guests over, it’s time for a change. A simple cabinet upgrade is the solution you need. With our professional craftsmanship and skill, we can make your cabinets look so good that your guests will be impressed. Investing in kitchen cabinet repainting provides a far better return on investment than a complete kitchen remodel. Did you know that updating your kitchen can increase your ROI by 70%, especially when you use neural colours and styles? When we update your cabinets, we apply a quality paint that stands the test of time and holds up better to daily wear and tear. By working with our team, your cabinets will look great for years to come. The small investment to update your kitchen cabinets will pay off when you need to sell your home. Freshly updated cabinets can add value to your home, as most real estate agents agree that the kitchen is one of the most important selling points. One of the first places homebuyers inspect when visiting a home for sale is the kitchen, and it may be the deciding factor for many as to whether they love the home or not. By improving this simple feature, you can see a world of difference in the look of your home. Just like repainting your bedrooms or bathroom, kitchen cabinet repainting services offer a variety of colours and finishes to choose from. You can get a completely customized look that makes your cabinets stand out as the focal point of your kitchen or blend seamlessly into the existing décor. Simply contact us for a consultation and we will help you make the right decision about your new paint. Cabinet repainting has a huge impact on the appearance of your kitchen—it refreshes the space to look brand new and makes it a more welcoming space for hosting friends and family. Seeing a space transformed before your eyes will give you a sense of excitement and satisfaction as though you’ve moved into a new home! Our professionals are trained and experienced to ensure you are completely satisfied with the project. If you’re looking for professional cabinet painters to update your kitchen, we can help! At Booth7, we are your one-stop shop to give your kitchen or bathroom a fresh new look and style and help you make wise, affordable decisions about updating your home. Our services also include free in-home consultation, competitive pricing, and custom designs. We handle all the details of your project from start to finish, so you can trust you are in good hands! To get started on your home renovation or painting project, call Booth7 today! Fill out our online form or contact us at info@booth7.com and our staff with respond to your inquiry within a few hours.